(CNN) -- A baby ape born in the UK is settling into a new life in a German zoo after flying from Birmingham to Frankfurt -- monkey business class. Bili the bonobo is to be fostered by an ape at Frankfurt Zoo. The three-month old male bonobo -- who is to be fostered by a family of German apes after being rejected by his natural mother -- was considered too young and too fragile to travel cargo class, a spokeswoman for the UK's Twycross Zoo told CNN. Instead, the tiny ape named Bili checked in for the Lufthansa flight with special travel documents -- including a fake passport in the name of "Bili the Bonobo" -- before taking a seat in the cabin alongside a handler from Frankfurt Zoo, who had flown over to accompany him on his unusual journey. "He was with his keeper all the way to make him feel more comfortable and relaxed, rather than being in a crate," said spokeswoman Kim Riley. "I just wish I'd been there to see the other passengers' faces." 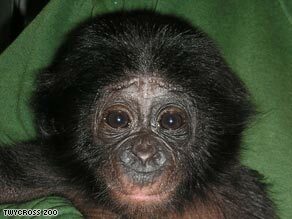 Bonobos, which originate from the Democratic Republic of Congo, are considered particularly intelligent primates. They are the human species' closest relation in the animal world, sharing 99.6 percent of our DNA. Bili was rejected by his mother after falling ill shortly after his birth and has required extensive nursing and medical care. Zookeepers in Frankfurt hope he can bond with an adult female bonobo which has been trained to assist with hand rearing babies. The zoo's bonobo community will also play and interact with Bili, helping him to acquire social skills. Bili will spend 30 days in quarantine at the zoo before being introduced to his new family, Riley said.